No Feeling of Falling: Food, Ritual, and What Were They Thinking? Food, Ritual, and What Were They Thinking? You catch the ortolan with a net spread up in the forest canopy. Take it alive. Take it home. Poke out its eyes and put it in a small cage. Force-feed it oats and millet and figs until it has swollen to four times its normal size. Drown it in brandy. Roast it whole, in an oven at high heat, for six to eight minutes. Bring it to the table. 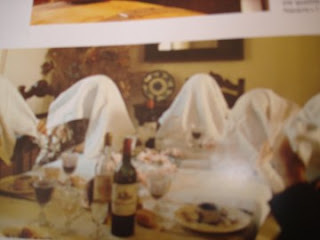 Place a cloth—a napkin will do—over your head to hide your cruelty from the sight of God. Put the whole bird into your mouth, with only the beak protruding from your lips. Bite. Put the beak on your plate and begin chewing, gently. You will taste three things: First, the sweetness of the flesh and fat. This is God. Then, the bitterness of the guts will begin to overwhelm you. This is the suffering of Jesus. Finally, as your teeth break the small, delicate bones and they begin to lacerate your gums, you will taste the salt of your own blood, mingling with the richness of the fat and the bitterness of the organs. This is the Holy Spirit, the mystery of the Trinity—three united as one. It is cruel. And beautiful. According to Claude Souvenir, chewing the ortolan takes approximately 15 minutes. The Urban Hunt as cited in the ortolan article on Wikipedia. Lest you think this is some medieval ritual, the last meal Francois Mitterand ate (eight days before he died of cancer) was a lavish banquet with a large number of guests. The final course was ortolan. It's technically illegal in France to eat it. Mitterand passed in and out of consciousness during the meal, but apparently ate his ortolan. I don't know what to think of that. I'm horrified, and mystified, and something else, all at once. I just don't know. I think the fragility and absurdity and pathos of humanity's relationship with the concept of Deity manifest in the sentence, "Place a cloth—a napkin will do—over your head to hide your cruelty from the sight of God." Who is this God who is befuddled by a napkin? At the same time there's a certain honesty to the ortolan ritual. We do this and so much worse in the modern meat industries: at least this ritual has an element of self-awareness, acknowledging the cruelty of the meal. Is a sacred brutality better than willfully ignorant brutality? I don't know. I can't believe you found this! I thought it was my own private bit of esoteric knowledge. I'm using the napkins over the head bit in a story I'm currently writing. 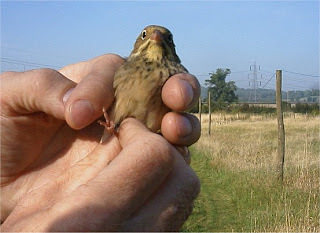 I think the overall info about the ortolon and how you eat it is pretty well-known for a long time. But the details. Those I never knew. Even I, who has eaten lion and hippo and snake and alligator and emu and bitten the heads off shrimp (dead and fried) would probably not be able to bite the little head off a dead bird--roasted or not. The napkin may not befuddle God, but it's an admission that you're doing something shameful, and doing it in a communal setting, which is what makes it interesting. Most of the preparation isn't particularly extraordinary--- you're treating a small songbird the same way you treat a duck when making fois gras. Except for the bit about blinding the ortolan. Where the hell does that come from? How does that enhance the dining experience exactly? It seems to me that this is the act of gratuitous cruelty of which one ought to be ashamed. Yes -- the blinding. Gratuitous cruelty. This does set it apart from foie gras, veal, cruelties that are, at least, pointful. The wikipedia article says (under 'Gastronomy') that it's to disrupt their feeding schedule so that they eat more.